How do I know which blind to choose? 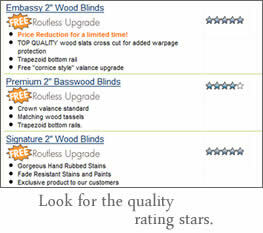 Look for the quality rating stars on our website to determine the quality rating for each blind or shade. Each product is rated on a scale from 1 to 5 stars with 5 stars being the highest quality. At Blinds Chalet each of quality blinds are made with superior components and materials. Thourghout the window blind industry, products are priced using a "price grid". Each product has their own specific price grid and may be skewed differently so be aware. Some blinds may be cheaper on smaller sizes but more expensive on larger sizes. We highly recommend choosing the window blind with the highest quality rating within your price range taking into consideration color, upgrades, etc. At Blinds Chalet we offer cheap blinds at the highest quality. Our products compare with the quality you would find with national brand names but our prices are much better.